Lockheed Martin Space Systems Co., Sunnyvale, California, has been awarded a $53,505,013 modification (P00680) for Advanced Extremely High Frequency (AEHF) system capability augmentation. The contractor will provide mission planning functionality to support the AEHF transition from initial operational capability to full operational capability. Work will be performed at Sunnyvale, California, and is expected to be completed by June 30, 2017. Fiscal year 2015 research, development, test and evaluation funds in the amount of $30,824,748 are being obligated at the time of award. 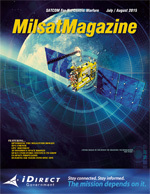 Space and Missile Systems Center, Los Angeles Air Force Base, California, is the contracting activity. (F04701-02-C-0002). Work will be performed at Los Angeles, California; Colorado Springs, Colorado; and Philadelphia, Pennsylvania, and is expected to be completed by June 30, 2017. Few plans survive contact with the enemy. No plan survives without a group of men and women standing behind the scenes tying all units together into a cohesive whole. U.S. Marines, Cpl. Shea P. Nolan and Lance Cpl. Edward Y. Cho, stand in front of a Secure, Mobile, Anti-Jam, Reliable, Tactical-Terminal during exercise Talisman Sabre 2015 at Robertson Barracks, Australia, July 6. The exercise is designed to improve U.S.-Australian combat training, readiness and interoperability. Nolan, from Wallington, New Jersey, is a tropospheric scatter radio multi-channel equipment operator. Cho, from Dix Hills, New York, is a satellite communications operator and maintainer. They are with 7th Communication Battalion, III Marine Expeditionary Force Headquarters Group, III MEF, currently attached to 3rd Marine Expeditionary Brigade. U.S. Marine Corps photo by Lance Cpl. Mandaline Hatch. 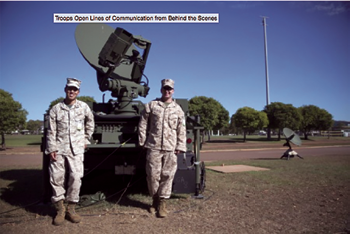 In order for Exercise Talisman Sabre 2015 to adhere to the commanders’ plans, U.S. Marines with 7th Communication Battalion established communication channels in Australia before the majority of the personnel arrived. Talisman Sabre is a bilateral training exercise between the U.S. Armed Forces and the Australian Defence Force designed to improve interoperability and readiness. More than 33,000 personnel are involved in the biennial exercise. While the role of Marines in the communication battalion is often overlooked during exercises, there is no doubt communication is vital for any exercise. The main goal of communication specialists is to create a real-time transfer of data. In a military activity as large as Talisman Sabre, which includes a full gamut of ground, air, sea, intelligence, cyber and practically every military asset the nations control, communication becomes exponentially complex. Talisman Sabre has units across the Pacific in Australia, Okinawa and Hawaii with more than 13,000 miles separating the locations. Communication specialists are using ground mobile force terminals to send data signals on multiple frequencies to a satellite located 30,000 miles in space. Transmissions are received through carriers on the satellite and repeated to other ground locations. Lance Cpl. Edward Y. Cho, from Dix Hills, New York, performs maintenance operations on a Secure, Mobile, Anti-Jam, Reliable, Tactical-Terminal during exercise Talisman Sabre 2015 at Robertson Barracks, Australia. U.S. Marine Corps photo by Lance Cpl. Mandaline Hatch. “We, as a communications battalion, allow everybody to join together to do their part in a cohesive manner,” said CWO2 Robert M. Childree, an operations officer with 7th Communication Battalion. During Talisman Sabre, time is essential. Vital information needs to be readily accessible at all times and communication makes that possible. “We’re not running letters by horse anymore. It’s all about speed,” said Childree from Hattiesburg, Mississippi. In this day and age, the world is dependent on technology. Establishing a secure and ready to use network is a necessity. Without communication specialists, military commands would not be able to effectively lead their troops. 7th Comm. Bn. is with III Marine Expeditionary Force Headquarters Group, III MEF, currently attached to 3rd Marine Expeditionary Brigade for the exercise. Harris Corporation’s Mid-tier Networking Vehicular Radio (MNVR) has completed testing at the Army’s Network Integration Evaluation (NIE) 15.2 held at Ft. Bliss, Texas. The MNVR Limited User Test (LUT) was conducted to test the ability of Soldiers at the company level to effectively use the MNVR to talk and send data, images and video to the battalion and brigade levels. Harris will review the results and incorporate changes as necessary before the Initial Operation Test and Evaluation in the spring of 2016. The Harris MNVR, which uses the Wideband Networking Waveform (WNW) and Soldier Radio Waveform (SRW), operates as a node in a mobile network, so information can hop from one MNVR system to another until it reaches its destination. At the LUT, battlefield conditions were used to determine how the WNW and SRW waveforms would perform with regard to message completion rates, latency and voice quality. Testers evaluated the radio using 23 different cases that ensured the network routing was properly configured. General Dynamics has received the first full rate production order from the U.S. Army to build additional Warfighter Information Network - Tactical (WIN-T) Increment 2 systems. The $219 million order includes the production of more than 300 vehicle-based network communication nodes along with related equipment and materials. WIN-T Increment 2 is the Army’s communications backbone providing secure, on-the-move communications, mission command and situational awareness for commanders and their Soldiers. The order allows the Army to continue fielding WIN-T Increment 2 to Army units currently scheduled to receive the system. WIN-T Increment 2 is integrated into Mine-resistant Ambush Protected (MRAP), High Mobility Multipurpose Wheeled Vehicles (HMMWV) and Stryker vehicles. To date, four division headquarters and 12 brigade combat teams have WIN-T Increment 2. The system successfully served Army units supporting the Security Force Assistance Brigades in Afghanistan by replacing the fixed communications infrastructure that was dismantled when the U.S. military closed its operating bases. Last summer, WIN-T provided the ‘communications grid’ for humanitarian operations responding to the Ebola epidemic in West Africa. Production of the WIN-T system takes place primarily at General Dynamics’ facility in Taunton, Massachusetts, and supports hundreds of jobs at General Dynamics and supplier locations nationwide. 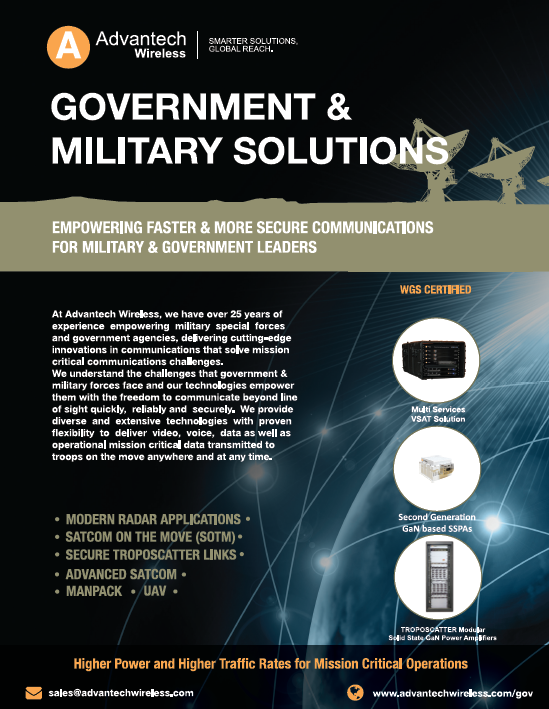 More information about WIN-T, tactical radios, satellite communications and the cyber-defense products that make up the Soldier’s Network is available at http://www.thesoldiersnetwork.com/.